Do you want to learn how to play the guitar easily, effectively and quickly? What is your playing level? Not sure? Schedule a free evaluation session! Are you a total beginner? Or have you started and stopped playing feeling unsure where to go next? Get a rock solid foundation and master the basics of guitar. Start playing songs you love with an expert instructor. ✓ How to play your favorite Songs. Music from traditional and contemporary sources. You will have the resources to play classic tunes in the following styles: blues, country, folk, rock, and gospel. ✓ Learn the formulas and patterns of music. You will be able to play over hundreds of songs and create your own music. ✓ The lesson material is catered specifically to each student’s level and interests. Learn at your own pace with patient guidance. ✓ Have fun while learning a new skill! ✓ Learn how to stay inspired and express yourself with music. Ready to start playing guitar today? Are you an Intermediate or advanced Guitarist? Have you played guitar for over a year? Stuck on a plateau in your playing? Ready to take your playing to a whole new level? ✓ You will get the tools to play basic chord shapes and major scale patterns covering the entire neck of the guitar. Learn how to play any melody in any key anywhere on the fretboard! ✓ Learn how to sing and play, songleading and songwriting. ✓ Learn more advanced chords, progressions, rhythms, strumming and fingerpicking patterns. ✓ You will have the tools to play hundreds of songs in different styles, derived from both traditional and contemporary sources. With an expert Guitar Player and teacher, you will achieve your goals with guitar! If you are self-taught or have taken lessons with other instructors, come get a refresher and fill in the holes in your playing. Experience breakthroughs in your playing and rekindle the joy of making music with guitar. Want to learn guitar in the comfort of your own home or office? 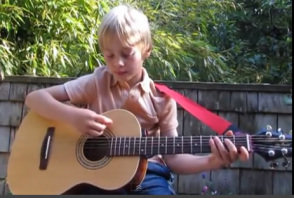 Guitar lessons for all ages levels and styles. Guitar made easy! Give the Gift of Music- Gift Certificates are now available!